These kinds of spam emails can either be from a free webmail or forged FROM sender. The common subject is centered on Windows 11, but the content of the message body may sometimes be about a different topic altogether. 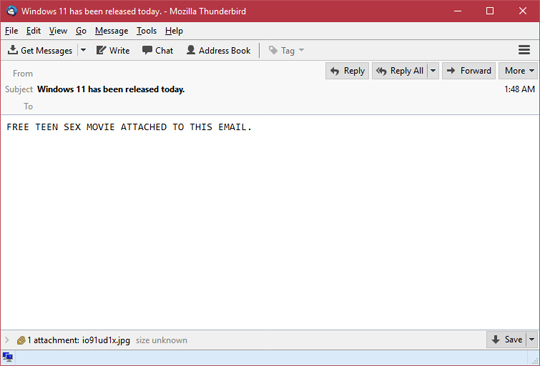 Meanwhile, the attachment is still an image file which is a .JPG file whose name is a series of random letters and numbers. Comparing the two images above, normal .JPG files have the marker FF D8 FF followed by JFIF in the file header. 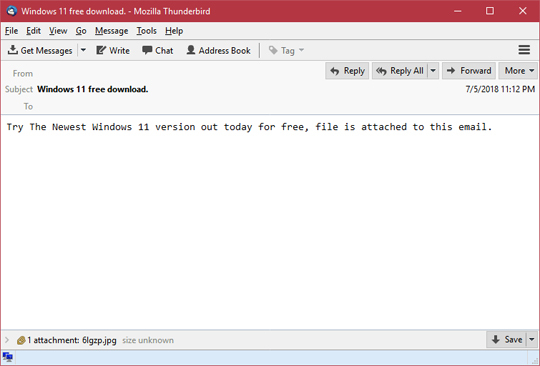 while in the malicious file masquerading as a .JPG file, the file header is akin to portable executable files. We highly recommend running an anti-malware product that is also capable of protecting against malicious attachments in email. Trend Micro products with anti-spam technology are protected from these bogus attachments.